Raccoons Rags: Kaye Wiggs 43cm (17") and 45cm (18") body sizing post. Kaye Wiggs 43cm (17") and 45cm (18") body sizing post. Now I have my Layla on the 45cm (18" MSD) body, I've been trying on the 43cm (17" Mei-Mei) sized clothing to find out what fits. Okay, all this stuff is made for the 43cm/17" body specifically, so it all fits that body beautifully. This is what fits the 45cm/18" body and the alterations you'd have to make. 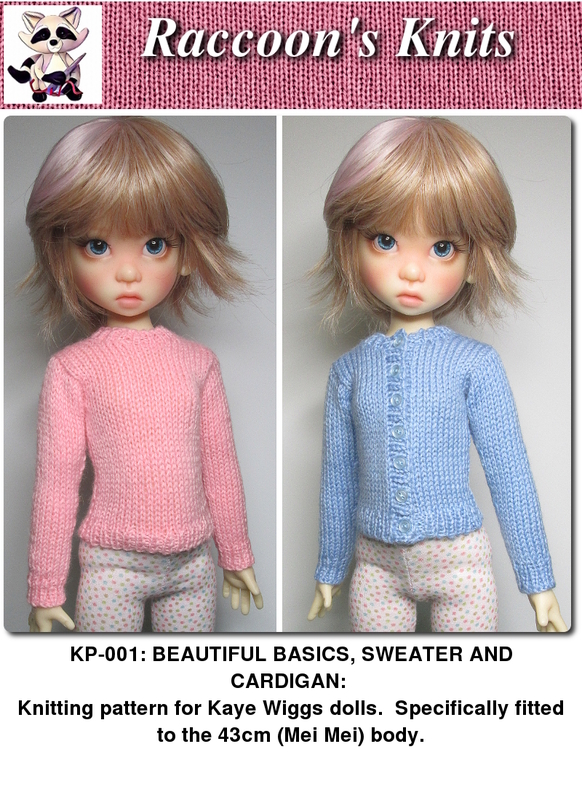 First up is pattern SSP-043: The ballet/dance wear. The leotard fits the longer 45cm/18" body surprisingly well. As long as you use the recommended very stretchy 4-way stretch jersey with Lycra. It's a little roomy at the shoulders and upper torso, but does look nice on the doll. From the back you can see the roominess. It's a decent fit though. A Facebook friend reports that her leotard was 1/2" too big in the waist for her 45cm/18". And that the body length as a whole is also 1/2" longer. The wraparound cardigan fits too, and is designed to fit over the leotard. It is a little broad in the shoulders though. Although this fabric is uber-soft and really gives. A slightly firmer stretch fabric might fit better. The tutu fits perfectly though, over the leotard. You should fit the waistband to whichever doll it's going to be worn by, when you come to sew on the snap. The higher up your tutu is going to sit on the doll's waist, the longer you should make the skirt length. By about 1/2" to 3/4". As for the tights - no dice. The red dot shows where the doll's actual crotch is. I think you'd need to lengthen the leg by about 3/4". The leggings are fine as they are. You could lengthen them according to personal taste. The skirt - as with the SSP-043 tutu, fit the skirt waistband to the doll before you sew on the snaps. The leggings look great, despite the 45cm/18" derriere being narrower than the 43cm/17". This fabric is the uber soft kind again, and a firmer stretch jersey would work just as well. I measured the legs at exactly 3/4" too short, so you'd need to lengthen them by adding that amount to the hem. Although I'd consider adding a whole inch if using a firmer stretch fabric. The sweaters, surprisingly, are perfect. Even at the shoulders. But this is sock fabric, which is super-stretchy, so tends to accommodate a wider range of sizes than most fabrics. Again, you may wish to add some length to the bottom hem. Around 1/2" to 3/4" should do it. Again, as the tutu (SSP-043) and the skirt (SSP-044) Fit the waistband to the doll before sewing on snaps. Those two bottom snaps do not want to fasten. There is a bit of room for adjustment at the top of the bodice, but a bit less at the lower edge of the bodice. You'd need to add a little to the bodice back edges - about 1/8" to make a better overlap, and fit the bodice to the doll like it shows you in the pattern instructions, before sewing on the snaps. Here's a better idea of length. It's still a very nice length on the 45cm/18" body. Which is reported by my Facebook friend as having legs that are a whole inch longer than the 43cm/17". You could add a whole extra ruffle and insert to the length of this skirt, but you'd have to remember to lengthen the centre panel by the same amount. And as for the outfit which has been listed in my Etsy store, The picot cardigan fits the 45cm/18" too. It's just a shame about the snaps on the dress. The picot cardigan will be the next knitting pattern I publish. Both the sweater and the cardigan fit the 45cm/18" body really nicely. You could add a few rows to the body length if you wanted. I'd add 6 to 8 rows personally. The sleeves are fine, because both doll bodies have the same length of arms. That's it. Fortunately, I only have four patterns that this post applies to. As I create more, I'll include sizing for both doll bodies as a matter of course. 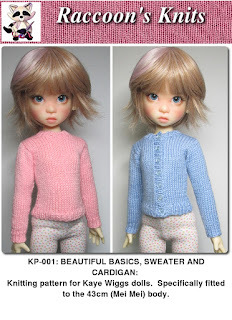 I have a different question - will you be releasing any patterns for IH JID girl? Hello there. Yes eventually I will, it's on my very long long list! But I only have a JID girl with the large bust, not the glamour or small. So the patterns would only fit that size of bust. And then I only have a few designs for the JID girl anyway. Depending on how well they sell though, I may develop new ones. SSP-046: Sewing pattern for Ellowyne. More outfits for Kaye Wiggs girls.